To call David Bowie a trendsetter is much too pedestrian. To write that he defies tradition and remains ahead of the fashion curve only begins to scratch the surface of his impact, influence and importance in men’s fashion. The truth is that David Bowie has been an icon in style for so long that he now serves as an icon for other style icons, which gives him a heightened status. While other musicians and performers often adopt a new personae for an album and tour only to discard the “character” once the ticket receipts have been counted, David Bowie’s various looks are all part of his wider view of art, theater, culture — and himself. He may choose a specific designer he likes and a new suit for a special performance (such as he did with Thom Browne and Browne’s line of suits with shortened sleeves and trouser legs, which revealed David Bowie’s sock-less ankles planted firmly in brown wingtips), but David Bowie is always David Bowie. He is the one wearing the clothes, and they are never costumes. The most enduring David Bowie look and the one he returns to time and time again is the white suit. What began as the Thin White Duke personae in the 1970s morphed into the country English gentleman on holiday in the 1980s, and continues today as the white suit finds itself as a resurgent fashion mainstay. The cuts and fabrics of today’s white suits have been updated, but the reckless abandon with which you should wear the white David Bowie suit has not. Go all the way and wear a white Banana Republic suit with a white shirt and white Bucks. 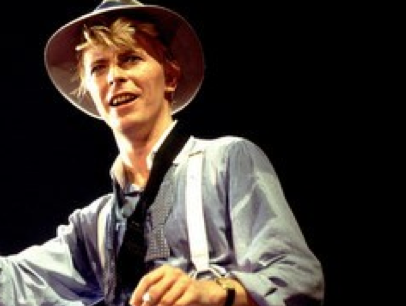 Shoulder padding and stitching may have changed over the years, but the look is undeniably Bowie.